Meru Cabs is on the fast lane catching up with it’s competitors like Ola and by partnering with MobiKwik and Paytm to make cab rides easier with mobile wallets. This time around, the third largest cab company is trying a hand at commercial carpooling service. It is the first Indian taxi service provider to tread on a path that many Indians still think they’re not ready for- Carpooling. Meru Cabs will create a user friendly interface for car owners and prospective commuters on the driver’s route to share a ride. The expenses for the car driver will be slashed with more passengers sharing the expenses of the ride and Meru cabs will take it’s share for getting drivers meet riders. Meru is all set to pilot the public carpooling app soon in Mumbai and hoping to do what Carpooling.com did in the Europe. Also it is rumored that Ola too is thinking on the same lines and probably wants to wait enough to learn lessons from Meru’s mistakes. Carpooling not only reduces travel expenses for the car owner and the riders but also is environmental friendly. The concept of carpooling is supported by the Union government as a green initiative and wants it’s citizens to pick it up, especially in metros. Siddhartha Pahwa, chief executive of Meru Cabs, confirming their new initiative said,”This will be a true marketplace model. Meru will earn its revenue share from day one by making the passenger and vehicle owner meet on a real-time basis.” The success of Carpooling.com in the Europe has triggered up other carpooling platforms such as France’s BlaBlaCar, Brazil’s Tripda, Isreal’s RideWith which are venturing into their neighboring countries to cash in on the people’s lack of carpooling mentality. Some of these platforms are also available in India for long distance commuters. Carpooling.com launched itself on the American roads in early 2011 but it’s success is short lived. Mumbaikars have their share of brushing up against carpooling startups such as Smart-Mumbaikar, Ridingo and ZingHopper to name a few. But for Indians where gaadi for most is the second most valuable possession after ghar and for many a symbol of prosperity that they leave on plastics on the seats till they tear off- the concept of sharing rides might torment them. 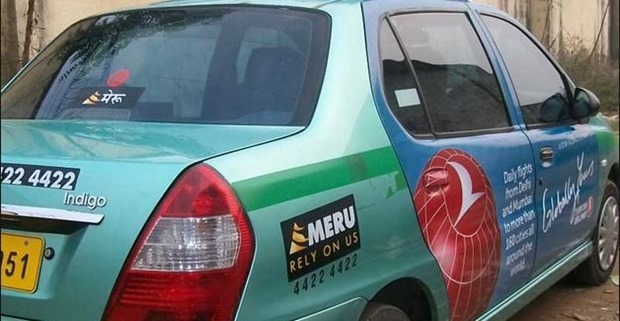 Of course, safety is another big concern in spite of advanced technical solutions placed to curb misfortunate happenings; Meru says it’s working on such issues to make the ride safer and easier on the pockets. Meru Cabs recently raised Rs. 315 crore from it’s investor IVFA and is hoping for this carpooling initiative to kick off soon. Though the concept of carpooling is a great initiative, there still lies a tad skepticism about how Indian drivers will take it.